Pope Francis has invited every Catholic in the world to join him at 5pm Roman time - 4pm here - on 2nd June, the Solemnity of Corpus Christi, in adoring the Blessed Sacrament. 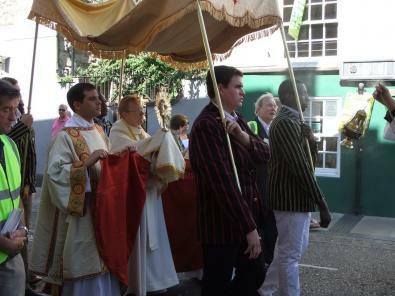 Here in Oxford we have the ideal way to do this with the Deanery Corpus Christi Procession, which takes place on this day. 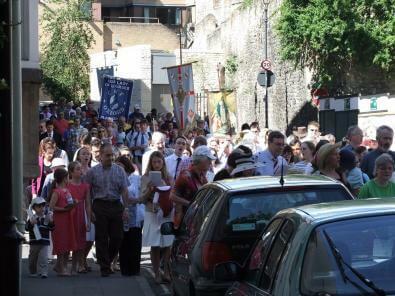 It begins at 2.30pm at the Oratory, stops at Blackfriars and concludes at the University Chaplaincy for Benediction at 4pm - the very time the Holy Father has asked us to adore our Lord's Eucharistic presence. As usual we will be accompanied by the Witney Town Band, and people are invited to wear uniforms, academic dress or First Holy Communion outfits.